We organise the Functional Safety and SIL for Safety Instrumented Systems training with certification since 2004. 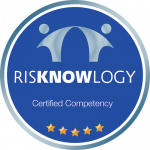 In the mean time the Risknowlogy training material has reached over 10000 professionals world wide. Risknowlogy offers the accredited Functional Safety and SIL for Safety Instrumented Systems training course for specialists, professionals and engineers. The course focuses on functional safety aspects for the process, oil & gas, and chemical industries according to IEC 61511. The main objective of this course is to give engineers, professionals and specialists involved in safety instrumented systems the opportunity to learn the fundamentals of functional safety and the requirements of the functional safety standard IEC 61511 in reference to the IEC 61508 standard. A second objective is to give anybody attending the course the opportunity to certify their knowledge through an exam. Who should attend Functional Safety and SIL for Safety Instrumented Systems training? Any professionals working directly or indirectly in their workplace with Functional safety and SIL for Safety Instrumented Systems. The course material and trainer knowledge are fantastic. Course content and examples are very good. It enhances the knowledge of every engineer. The material is very good, it gives much clarity about functional safety. This course is very complete, and the training is made simple and clear. It was a very useful course for our projects and explains how important it is to comply with the standard. The course teaches you that functional safety is necessary for all disciplines, very useful. Trainer was very patient to listen & answered to all questions. Effective course teaching all the knowledge about SIL, SIS and SIFs from the basics to the details. Well organised course that teaches you functional safety in depth. This course is very good. I learned a lot. This course gives you all the detailed information you need to manage your SIS and functional safety. Very informative and relevant. The course was excellent, from content up to delivery. Eveyr body should learn about FSM. Excellent course that delivers a lot of information about SIS and tools for SIS. Very well course and very informative. Every colleague should follow this course to gain knowledge about functional safety. Excellent course to learn functional safety. Very good course. This course is excellent to develop your career path and to gain knowledge. The trainer is highly competent, has explained the course material very well in an excellent manner and easy to understand way. Great course to understand and apply concepts related to safety systems and to consider them while we bid for new projects. The training sessions where well organised and with good content. Excellent course if you want to understand the standard. Enjoyed the course, excellent trainer and great material. Fantastic trainer, demonstration of gaps between standards & industry trend. It is setting a good foundation for my projects involving SIS. Very good trainer with full knowledge no the subject and always full of energy to answer all questions. Very enlightning course. Learned the fundamentals of functional safety. This course is very effective in teaching functional safety for safety instrumented systems. Details are explained in an easy to understand manner. Well organised course. It gave me in depth knowledge about functional safety. Very educational, mainly functional safety management. Very good but intense course. A lot of fun though with this teacher. Very useful to understand FSM fully. End users must cover FSM more strictly. Friendly, knowledgeable teacher who created a great atmosphere during the course. Relatively boring subject made exciting. There are a lot of practical examples. This course makes a good combination between theory and practice. Very positive about this course and the instructor. Learned a lot and I can now positively say I know what to do for functional safety. It is good to get the knowledge about what is functional safety and how to implement it as per standard requirements. Content is very good, specially for new professionals who do not have background in functional safety. The trainer was excellent, he listed patiently to all queries and tried to answer all of them. Best knowledge and information of functional safety in one course available. Everybody involved in SIS should follow this course. Great knowledge. Course gives overview of all the safety life cycle. the trainer is very good in explaining things with regular real life examples. Things get clear easily this way. Very helpful in growing awareness about functional safety management and in building skills related to hazard and risk analysis and SIF and SIS design. It clearly explains the importance of functional safety in in the various stages of the life cycle. This course met my requirements and gave me lots of functional safety knowledge and awareness. Gained a lot of knowledge. This course is important for any process industry professional. It teaches functional safety and we as SI understand our role. Teaches you to work in a systematic way, to organise, plan and schedule. I enjoyed the structured way of teaching and the interactivity of the course. Very good course. All my practical questions were answered. Follow this course if you want to improve you skills in functional safety or in your organisation. It is very useful and has a lot of contents. Anybody who should be familiar with risk and its impact on process design or who need to design the right SIS should attend this course. Very good for anybody who needs to understand SIS and the importance of SIS. Very beneficial for any body involved in SIS. You learn about FSM, hardware and software and much more. A lot of information related to SIS. If you are involved in SIS, this is your course. Most perfect course ever. The trainer made it more interesting and well. Everything was well organised and systematic. The trainer is very good/excellent and coverage of functional safety is high. Easy to understand from the course notebook. In general, the course was very very useful.